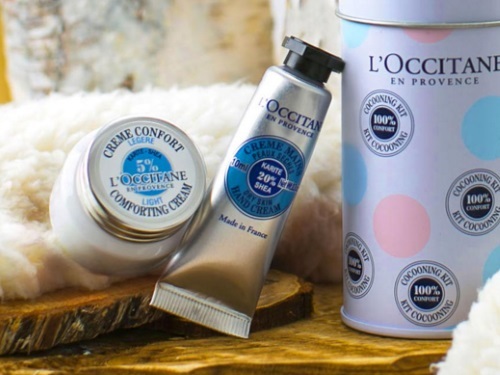 L'occitane En Provence has a new freebie! They want you to #SpringintoShea with a Free Shea Starter Kit! Get a 10ml shea hand cream and 8m comforting light face cream, both in a collector tin box! Just sign up at the link below to get your voucher. Free Shea Starter Kit may be redeemed from April 11, 2016 until May 8, 2016, or while supplies last. Available in boutiques (excluding outlets and wholesale partners) by presenting your email with the unique promo code at checkout or online at ca.loccitane.com using your unique promo code. One (1) gift maximum per person, customers may not redeem on behalf of friends or family. Your Special Extra Gift (‘$10 off any $35 purchase’ and ‘Free Standard Shipping Online’) is only available at the same time as the redemption of the Shea Starter Kit by spending $35 or more on regular priced products, before taxes and shipping; also valid in Canadian boutiques (excluding outlets and wholesale partners) and online using the same unique code for your Free Shea Starter Kit. To be even more clear, I think the fine print that I quoted above was, but some people still seem to be confused about this offer. The Shea Stater Kit is free, you do not have to buy anything! In the voucher there is also a $10 off $35 coupon (as well as an online purchase option) that you can use if you want when you redeem for the free kit. This offer is coming from a retail store, not a sampling website, so of course they want to make a sale and this sample offer brings you into the store. Their products are excellent and if you want to buy something you can with the awesome coupon that they offer with this, but you do not have to buy anything to get the Free Shea Stater Kit. Just go into the store and inform the sales associate that you have this offer and would like to redeem for it. You do not have to buy anything. Crystal clear? I hope so. You do not have to buy anything, but you can if you choose to.